The bite-size Snickers bar, also known as Snickers Miniature, is the smallest offering in the Snickers candy bar family. Bite into a bite-size Snickers bar for a tiny treat that packs bite-sized calories. Like the original Snickers, this bite-size version offers nougat, caramels and roasted peanut encased inside milk chocolate. While the original Snickers weighs in at 2.07 oz., this small treat weighs a mere 0.9 oz. A single bite-size Snickers bar contains 42 calories. These Snickers Miniature bars are not available for individual purchase. According to the nutritional label on a bag of bite-size Snickers bars, four bars, containing 168 calories, are considered a serving size. Nearly half the calories in a single bite-size Snickers comes from fat; however, when your treat is so tiny, this only amounts to 2.25 g of fat. There is 4.5 g of carbohydrates and .75 g of protein in a bite-size Snickers. Eat one bite-size Snickers, not the four suggested by the serving size, when you want to indulge. 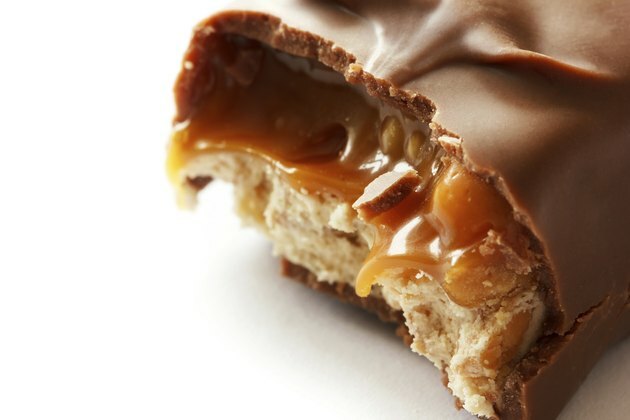 Bite-size treats, such as the Snickers, will have minimal impact on an otherwise healthy diet when enjoyed in moderation.